Cinco de Mayo is only two days away! If you are looking for fun activities to teach your children about the REAL history behind this holiday and the significant impact that the Battle of Puebla had on U.S. history, don't forget that I have a bilingual mini-book coloring book available in my TpT store and here in my MommyMaestra Shop. (Psst! It's on SALE this weekend only! Get 20% off now through Monday.) Both this and the next printable are instant downloads, so you don't have to wait around to get the materials. Just purchase, download, and print! This book includes coloring pages of items related to the history of the holiday, as well as brief descriptions in English and Spanish that are easy for young children to understand. For older children, I also have this brief reading passage. 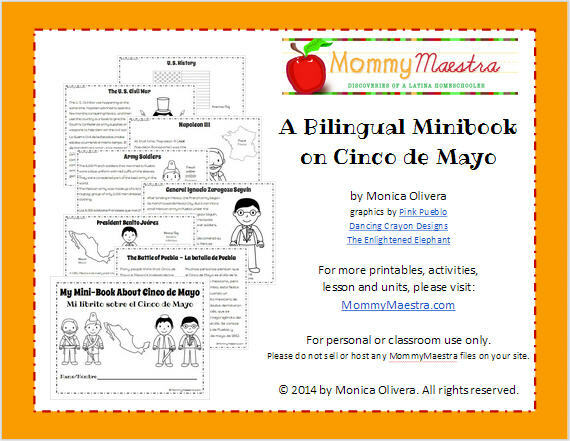 It is a one-page history on the Battle of Puebla and Cinco de Mayo available in on TpT and my MM Shop. 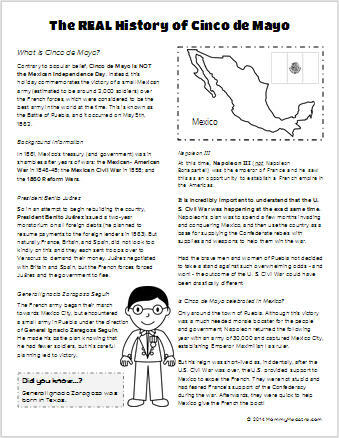 From Benito Juarez's decision to stop paying foreign debts for two years to the significance of the battle on U.S. history, this informational text is written for students in 2nd - 6th grade. It includes an 8-question comprehension quiz plus answer key.